In March 1996 I was lazily lolling about in my local leisure centre swimming pool, when along came two diving instructors demonstrating the use of SCUBA equipment. My interest was aroused, and I asked to have a go. That was my first experience of breathing underwater. One month later I was hovering sixty feet down near the ocean bed, about five miles off Baltimore West Cork, breathing deeply and nervously, in cold murky waters. Not quite the Undersea World of Jacques Cousteau I had envisioned! This story is about my journey from the warm safe confines of a leisure centre to enchanting and demanding undersea water world, leading to a hobby that I have enjoyed intermittently for the last twenty years. For me, SCUBA was both exhilarating and challenging, knowing that failure could have critical consequences, yet with appropriate training, knowledge, skills and experience it could be done safely. I enrolled in a PADI Open Water diving certification course, which consisted of four confined water training sessions, in a swimming pool, and four ‘real’ dives in the sea, plus exam based study of the PADI (Professional Association of Diving Instructors) diver manual. This was essential training before I could experience the Water world, where everything looks, sounds, and feels different in an environment of ever changing colours, aquatic vegetation, and myriads of fish and animal life. 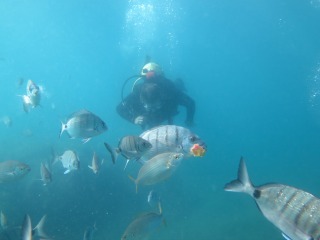 You can enjoy some of the joys of sea with a mask, snorkel, and fins. But snorkelling won’t allow you to stay under water very long, nor dive deeply. For that you need SCUBA equipment, consisting of a regulator and compressed air tank. In addition you will need a wetsuit, gloves, boots, a weight belt, a buoyancy control jacket, and various gauges including compass, pressure and depth gauge, and a watch. The compass gives you greater awareness of your position underwater, and may be needed when viability is low. To avoid decompression sickness a diver has to have regard to depth he/she is diving at, and the time spent under the water. A typical dive would last about 45 minutes, and novice divers should not dive any deeper than 18 metres. There are skills to be learnt to enable you to safely enjoy diving: Scuba equipment assembly, Mask clearing, Regulator clearing and recovery, equalising ears, buoyancy control, descending and ascending, diving communications, removal and replacement of weight belt and scuba unit underwater. Later, I completed the Advanced open water training course, which included additional skills such as Navigation, Night dive, Deep dive (25m), Safety stop, and Wreck dive. I’m a holiday diver, it’s not my main hobby, yet it has added immeasurably to my holiday experience in appropriate locations. 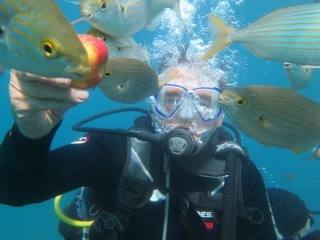 I’ve dived in Ireland, Gran Canaria, California, South Africa (with sharks! ), and the Great Barrier Reef in Australia. In all I’ve done about 40 dives, but hadn’t dived from 2010 to 2017, when my passion shifted to hill walking. So for my 70th birthday (January 2017) challenge I returned to where I had done most of my training-Taurito/Mogan in Gran Canaria, wondering if I still had the nerve, and the energy. I hadn’t dived in 7 years. Was I too old? 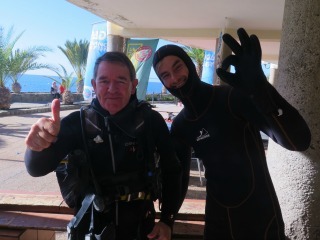 I did six dives, thanks to the brilliant support and encouragement from Jerry O’Connor and his team of Dive Masters, at Canary Diving Adventures. It was one of the best holidays I’ve had so far in retirement. Scuba diving isn’t just for young people. More and more seniors are exploring the ocean’s depths, and learning to live happier and healthier lives in the process. Regular medical check-ups can ensure that you have no age related problems that could affect underwater safety. There are many health benefits of senior scuba diving. If you are moderately active, retirement hobby scuba diving is an excellent low-impact aerobic activity. 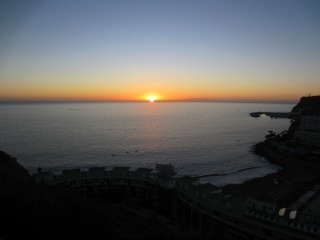 And it’s an excellent way to maintain physical fitness while expanding your horizons and exploring the ocean’s depths. For many retirees, scuba diving may be an ideal retirement hobby. It’s not too expensive, and it’s an exciting way to keep the body healthy and the mind sharp. As more people live well past retirement age, many seniors will be looking to take up new retirement hobbies to keep their minds sharp and their bodies healthy. Try it...retirement hobby scuba diving could become a passion that changes your retirement plans! Although two thirds of our world is covered in water, it had largely been unexplored until the 1940s. Divers owe a lot to Jacques Cousteau, ‘the father of scuba diving,’ In 1942, Cousteau was co-inventor of the Demand Regulator, which allows divers to breathe underwater with ease, from compressed air in a SCUBA tank (self-contained underwater breathing apparatus). This gave recreational divers access to the underwater world.